Brazil is indeed stuck in the past. However, this temporal disjunction is less the outcome of being economically or institutionally backward, but more of an insistence on resorting to violence as a mean of managing political anxiety. In 2014 the world’s gaze is turning to Brazil. The country is, after all, holding one of the globe’s most anticipated mega events, the football World Cup. As it were, Brazilian authorities are expected to perform accordantly, which they have consistently failed to do, leading to a major delay in the infrastructure preparations. On the verge of the World Cup Brazil has ‘ceased up’, leaving it in doubt whether some stadiums will even be ready by the time the first match kicks off. This is certainly unacceptable in a host country, but has generated even more unacceptable responses from anxious northern spectators. Impressively enough, but hardly surprising, this renewed interest in Brazil has managed to resurrect some of the worst, most condescending, and excruciatingly derogatory stereotypes long used to explain why the country struggles, and has always struggled, to keep up with modern times. This sort of stereotypical response can be seen, for instance, in a recent Economist piece entitled “Brazil’s Economy: The 50-Year Snooze”. Assessing the reasons for Brazil’s poor economic performance, the piece puts forth a classic neo-liberal argument built upon a frightful array of detrimental clichés. The Economist explains Brazil’s inefficiency by its workforce’s notorious unproductivity and stupor. But, however flawed the text itself may be, it is the piece’s header that is most shocking, alongside a decontextualized picture of an unproductive ‘native’ snoozing – someone probably relaxing on vacation. This is offensive, paternalist, and quasi-colonial. This discourse of ‘Brazilian belatedness’, in which specific historical problems are explained as the projection of an inherent slowness of the Brazilian ‘condition’, proposes too easy answers for extremely complex issues – the lack of infrastructure, low levels of productivity, and poor economic performances. The workers’ ‘cultural laziness’ then translates into the country’s eternal belatedness. The discourse is quite widespread, and abounds within the mass media, within academia – in some traditional branches of Political Science and Economics – where the country is still studied as if it were trying to ‘catch up’. Brazil is never democratic, never developed, and never active enough as a regional leader. When the country does not have to catch up with Europe and North America, it struggles to echo the pace of its fellow BRICS colleagues. And thanks perhaps to a very successful process of colonisation, this same discourse emanates from Brazilians themselves. Nevertheless, a belief in a ‘country of the future’, with an ever-unfulfilled potential, conceals the systematic construction of a ‘country of the past’, always delayed in relation to more ‘advanced’ societies. Stick to this particular discourse, and the World Cup deferral comes as little surprise: Brazil is stuck in the past. Brazil is indeed stuck in the past. However, this temporal disjunction is less the outcome of an economic or (and) institutional delay, but more of an insistence on resorting to violence as a mean of managing political anxiety. 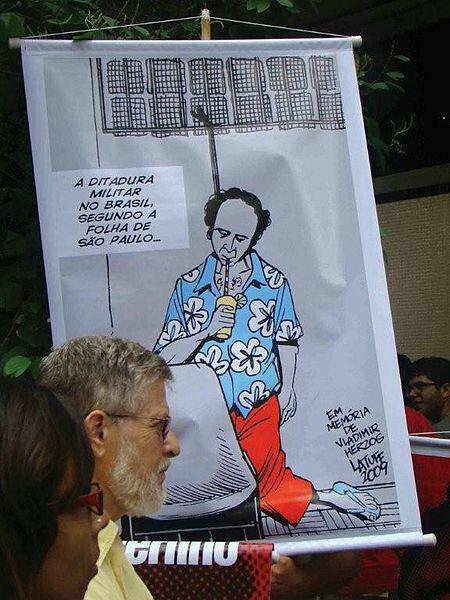 A 2009 Brazilian protest poster based on the notorious photo of the journalist Vladimir Herzog, murdered in detention in 1975, with the sarcastic caption: "the military dictatorship in Brazil, according to Folha de São Paulo". Wikimedia/Ditabranda. Some rights reserved. Brazilian authorities and society seem hooked on a logic of ‘either love or hate’ inherited from times when the country heatedly fought the Cold War, a violent event usually forgotten by anxious northern spectators awaiting the World Cup, or economic experts providing different solutions for Brazilian belatedness. But this disproportional focus on the Brazilian economy and World Cup hysteria risks overlooking the pernicious consequences of a Brazilian economy of violence. But 2014 also marks the fiftieth anniversary of 1964, the culmination of a series of events leading to the ‘Lead Years’ of authoritarianism and state repression (1964-1985). 2014 is also the year when the National Truth Commission (CNV), instituted in 2012, is due to release its report on the past violations of human rights. This act of remembrance is not only fundamental to understanding how the Brazilian authorities strive to manage the political anxiety arising from World Cup hysteria, but also poses the question of whether the country will be able to leave behind it this historic dynamics of violence. So far, responses to the threat of social unrest and insecurity are sadly still exhibiting strong traces of the extremist logic permeating the events of half a century ago. This can be seen in three different violent forms of managing political anxiety which – having been systematically used in the authoritarian past – are currently employed in the democratic present. In June 2013 a spectacular phenomenon occurred in Brazil: the massive and widespread wave of protests that took over the country leaving society, the authorities and academics stunned. The protests, initially raised under the flag of free public transport, suddenly became much wider, gathering a multitude of different demands united through a feeling of general discontent with the Brazilian Government. This series of protests, later named the “June Journeys”, produced a lot of anxiety. We want humans rights, not financial rights. For a true democracy. Wikimedia Commons/Caroline Freire. Some rights reserved.Interestingly, the demonstrators’ motto during the protests was that, “The Giant has awakened”. Such a co-optin of the discourse of ‘Brazilian belatedness’ reflects the movement’s elitist, misguided perception that Brazilian society had been indeed ‘snoozing’ for a long time, stuck in a period of political apathy and state-phobia until the young intelligentsia “finally left Facebook and went on the streets”. Some demonstrators, and journalists too, eager to portray the “journeys” in their uniqueness, managed to wipe out decades of Brazil’s social struggle in this account. The June Journeys grew in orders of magnitude once they reached São Paulo. To make their indignation heard the demonstrators took over the major avenues of South America’s biggest city. They metaphorically forced the “city that never sleeps” to a sudden halt. Aware of their actions, some elegantly apologised in banners stating: “sorry for the inconvenience, we are changing the country”. Using a rather interesting logic, the June Journeys needed to stop São Paulo’s time, just to put it in motion, to promote the very change they pursued. They disturbed the country’s financial heart to question the market-like necessity of economic policies, stating the powerful political value of 7 pence. 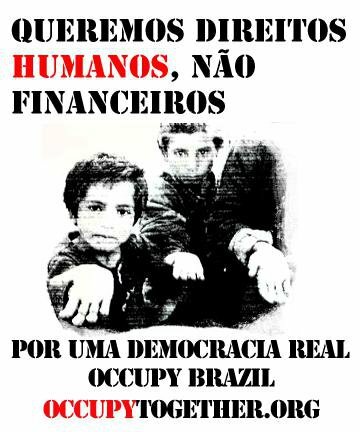 Following São Paulo, another 200 cities scheduled their own demonstrations nationwide and overseas, including London. Unfortunately, their so called ‘awakening’ turned out to be deeply traumatic. Forcing the ‘city that never sleeps’ into a snooze made the authorities and society at large particularly anxious. After all, for productivity reasons, it was imperative to keep the country’s financial heart fully functional. On top of that, no one seemed able to understand a movement with such a vast, and at times contradictory, set of claims. In São Paulo, the response to a mostly pacific, if confusing, wave of protests was the resort to police repression, brutality and arbitrariness. The city shock troops – a special section of the militarized police – was called in to restore the city to its normal pace and they did it with a repertoire of (expired) gas bombs, arbitrary arrests, repeated beatings, and other less-lethal weaponry. Rubber-bullets soon reminded demonstrators of the reality they were ‘awakening’ into. Shock troops are aptly named. The militarized police brutality to restore order reminded the Brazilian upper classes of a time when the military used electric shocks to repress political opposition. This police brutality left the constricted boundaries of deprived areas, where torture has been routine since the democratization of Brazil, and ventured into the spotlight for everyone to see, where it immediately became appalling. After the events in São Paulo, the June Journeys kept on growing in both size and violence. On the June 21, when 1.25 million people had gone to the streets and the protests had clocked up two deaths, President Rousseff gave an official speech broadcast nationwide. She stated, with a surprising twist, that the event had shown the force of Brazilian democracy, and the youth's desire to lead the country forward. However, Rousseff warned people against turning what she called a “new political energy” into a pure violent impulse, with a clear reference to the ravaging, depredation and chaos waged by some demonstrators. According to her,letting violence set the tone of this movement, could not only missing a historic opportunity for political action, but also threaten some of the country's dearest achievements. She stressed that, “public security sections have the duty to restrain, under the limits of the law, every form of violence and vandalism”, emphasising the fact that the demonstrators “authoritarian violence and ravaging” had “shamed Brazilian society”. Later on, Rousseff turned to personal reminiscence: “my generation fought so the voices on the streets could be heard. Many were persecuted, tortured and died for that goal. Those voices need to be heeded and respected, but they cannot be mistaken with the noise and truculence of some rioters”. Rousseff showed here how general acts of remembrance can serve the purpose of managing social and political unease. In her attempt to control the anxiety surrounding the June Journeys, the president revealed the political importance of remembering the past in order to forget it. The June Journeys threatened not only the 2014 World Cup, but also of course, the 2014 presidential elections. For some, by addressing the nation, Rousseff tried to portray herself as a reasonable democratic president capable of dealing with political opposition; that is, she tried to profit from the chaos. But the president failed first and foremost by omitting any reference to the police brutality shown during the demonstrations. A survivor of torture during the dictatorship herself, she attempted a strange sort of justification for the repression carried out by the militarized police throughout the country: it was their defensive duty to inhibit the rioters. Rousseff was not the first to viciously attack demonstrators, while blindingly forgetting and at times even praising the violence of the militarised police. During the June Journeys the governor of São Paulo state and the mayor of São Paulo city, alongside a famous right-wing oriented Veja Magazine, framed the on-going demonstrations as a series of “unbearable acts of vandalism”. In a distasteful vein, Veja also praised the shock troopers’ “strong measures to secure order”. But it was Reinaldo Azevedo, Veja’s columnist, who first stated what would set the tone of the debate from then onwards. Azevedo not only described the demonstrators as “lunatic fascists playing at direct democracy”, completely disqualifying whichever political claims they possessed, but proceeded to perform the contemporary world’s ultimate act of de-politicization: he named the wave of protests, ‘terrorism’. Azevedo’s comment would probably have been dismissed as unnecessary exaggeration, had the wave of protests not taken a violent turn. As the initial strength of the June Journeys was progressively undermined by several attempts at appropriating the “movement” from both left and right, large numbers gave way to a series of scattered, smaller demos. This loss of momentum of course reminded everyone involved that Brazilians were tired and would finally resume their customary ‘snooze’. In fact, the demonstrations were becoming increasingly violent, and in a different way. The initial ravaging carried out by some demonstrators was turned into violence against the police officers themselves. Of course this can be seen as the progressive radicalization of the Black Blocs, an anarchist organisation, or even as a response to the shock troop’s brutality, but the fact is that violence grew out of control. Perhaps the first time this happened was in 2013 on the days after a hundred thousand people took to the streets of Rio’s city centre. In one particular episode, 300 demonstrators seized a group of 50 militarized policemen when trying to invade the local state court building. The rioters attacked with petrol bombs, and the officers replied with fire. The engagement left at least 34 injured, of which 20 were policemen. This escalation in violence was crowned with the death of a cameraman in February 2014. During a demonstration in Rio, Santiago Andrade was hit by a firecracker’s explosion, and left brain-dead by a man associated with the Black Blocs movement. His death generated a major outcry. Among claims that the Black Blocs were a fascist organization, and concerns with insecurity during the World Cup, Azevedos’ words resonated more strongly: surely this was terrorism. Shortly this death, the National Senate returned to a discussion of the Anti-Terrorism Law (bill 499/2013) as an urgent matter. There was a clear desire to legally categorise a crime condemned by the Federal Constitution, but left with no clear legal definition, before the World Cup. In justifying the bill, senator Viana urged a problematic pre-emptive logic: “Today, the state of Brazilian legislation allows a citizen to explode in rage first, hit someone’s head […] and then we see what we make of it”. Viana – from Rousseff’s Worker’s Party – further echoed the president’s speech: “I myself, during the dictatorship, took part in dozens of demonstrations without any kind of aggression”. The past was once again used to vindicate nefarious consequences of present political actions. The Anti-Terrorism Law was largely criticized by intellectuals and practitioners as a vague text that could lead to the criminalisation of whole social movements. Some deemed this a “hysterical outbreak”, harsher than the dictatorship’s 1969 National Security Law - preoccupied with the safeguarding of Brazilian territorial autonomy against communist-subversive terrorism. While the discussion surrounding Bill 499 was left aside after such a commotion, a current review of Brazil’s penal legislation supported by Gilson Dipp – the first coordinator of the Truth Commission – is now tackling the issue. Responses to insecurity in contemporary Brazil show a conflation between past and present. In the quest to manage anxiety and secure order, authorities and social groups alike have resorted to the dismissal of opposing ideas, the denial of legitimacy to the political opposition and, at extreme times, the physical obliteration of dissidence. The internationally praised “country of differences” has insistently shown a rather peculiar tendency to obliterate pluralism in the name of order. It is this persistence that grounds Brazil in the past. This politics of obliterating difference was at play in the 1964 eve of coup, when the radical left pushed for land reforms disregarding political resistance; it was at play during the “Lead Years” when a striking repressive apparatus was organized to eliminate the communist “threat”; and it has been kept alive in the “war against crime” by a still deeply militarized police force who perceives torture as a legitimate professional technique, supported by a still punitive society who believes “a good thug is a dead thug”.